According to the Transportation Research Board, it takes about 10 million tons of road salt to keep roads safely navigable in the winter. 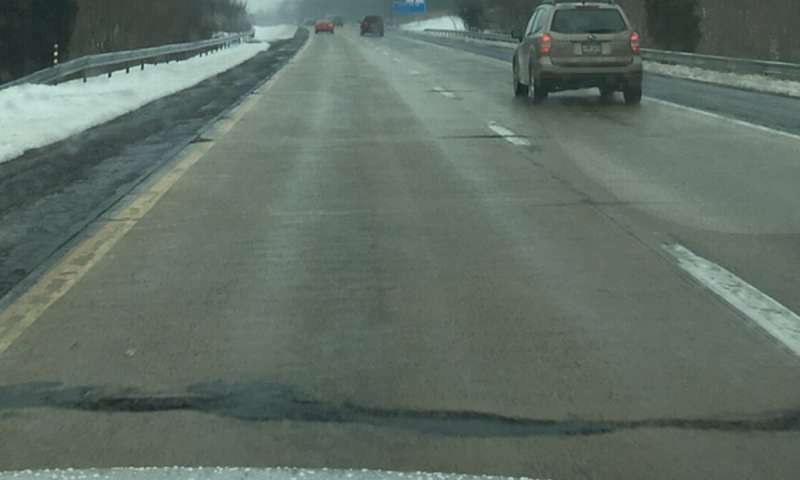 And while it's certainly an effective method for staving off snow and ice, around this time of year, we start to see the toll it takes on our infrastructure in the form of cracks, potholes and bumps. It turns out, those bumps aren't just the inevitable annoyances that come with wear and tear – they're actually caused by a chemical that forms when road salt reacts with the surface of roads, bridges and sidewalks that are made from white-gray concrete. According to the U.S. Federal Highway Association, winter road maintenance accounts for roughly 20 percent of state department of transportation maintenance budgets, through spending more than US$2.3 billion on snow and ice control. This does not include the billions of dollars needed to repair infrastructure damage caused by snow, ice and deicing salts, fixing potholes, patching and reinforcing roads and dealing with the corrosion that salt causes on the metal parts of vehicles. The annual direct losses caused by corrosion on U.S. highway bridges are estimated at $276 billion, approximately 3.1 percent of the nation's gross domestic product. One of the best ways to block the reaction from happening is to make sure there aren't enough ingredients for it. So, we wanted to create another chemical reaction that could use up the calcium in road salt before it reacted to form CAOXY. On the other side of our lab, students were examining bacteria called Sporosarcina pasteurii to understand how they performed their magic. The bacteria, which are commonly found in the soil, have the unique ability to convert nutrients and calcium into calcium carbonate or calcite – also known as limestone, a common stone in Earth's crust. This bacterium, S. pasteurii, is credited with depositing limestone as a binder (or glue), aiding the formation of coral reefs and helping to bind and stabilize soil. So can using bacteria before the salt assault really save us from road damage? I think so. Of course, more work is needed to fully understand the interactions of S. pasteurii with deicing salt and its effect on concrete performance. My colleagues and I don't yet know how quickly bacteria perform this chemical reaction, and we are working on promising ways for how we would add the bacteria to the roads in a real world situation. But this is a path worth pursuing, because it's unlikely we'll be able to kick our addiction to road salt any time soon. Was recently in detroit during a few snowfalls. They use massive amounts of salt on their concrete roads, which are in horrible condition as a result. Not to mention the vehicles which are all rusted out. Same with ohio - absolutely no snow anywhere but the highways looked like they were snowed over with all the salt. I suppose the faster the cars rust out, the more cars they will sell. Lots of auto industry in MI and OH. And of course pavement contractors and salt spreaders make lots of money too. Detroit - corruption is the problem there, not the salt.